Throughout all of season 2, rather than dig itself out like Kevin Garvey after his eight-hour sojourn to the afterlife, The Leftovers has gone deeper down the rabbit hole. Indication of the descent has always been there, lurking around the edges of the story, though not entirely evident until the fever-dream madness of 'International Assassin' brought with it an almost overwhelming amount of figurative language and metaphor. Whatever else may have been thought of it, the hour was a perfect example of Damon Lindelof's creative wheelhouse: the desire to plunge deeper into mystery, to explore strange occurrences destined to remain unexplained, and to face circumstances beyond the grasp of even those who are experiencing them. But mostly, it was to hint at something greater, something as guiding and benevolent a force as it is indiscriminately destructive. To a certain extent, then, the entirety of The Leftovers' season 2 finale reads like a meta-commentary on the journey undertaken by Lindelof and his stable of writers, in what has been an amazing creative reinvention of an already very good series. 'I Live Here Now' is as much a statement made by the series to its audience, its critics, and the powers that be, as it is Kevin's response to Meg, as she stands in all her white-clad apocalyptic glory amongst the ruins of the Miracle National Park Visitor's Center. The Leftovers, like its core cast of characters (both new and old), has found itself. It has been reborn. It is home. The finale picks up where 'International Assassin' and 'Ten Thirteen' left off. The tension of Meg's plan and the twist shown in the final moments of last week's episode feels as pressing as the residual tension still in place following Kevin's resurrection. In other words, the episode offers up a heaping helping of tension, a kind that courses unabated through almost the entire 75-minute runtime, until Nora happily greets Kevin and the tears start flowing. Until then, however, the tension is inescapable; any scenario seems possible because the series has already demonstrated anything is possible. The nervousness is present in nearly every confrontation and interaction, ratcheting up the anxiety to an almost unbearable level, but without it becoming wearisome or at the expense of the story. "Are you? Sure he'll come back?" John asks Jill, after she assures him her father will be returning home. "Oh, he'll be back," is the response John is given as Kevin comes walking around the corner with Michael in tow. It is a layered response, one that is as much evidence of the faith Jill and Laurie have in Kevin's return, as it is a clever nod to where he has been, and what will befall him during and after his conversation with John. Lindelof and co-writer Tom Perrotta may be foreshadowing the episode's climax, but that doesn't necessarily dilute the intensity of Kevin Carroll's performance or the eventual arc of his character. Kevin, for his part, seems relieved. Not just because Patti is no longer following him around, but because he has an answer to one of the central mysteries of the season and knows that, even if it doesn't resolve the motive of Evie's disappearance, it at least rules out another Departure. John, for all his disbelief, seems more burdened by the idea that Evie didn't Depart or wasn't taken, that she left him and her family behind of her own free will. It puts the onus of his pain and anger on someone he loves and he thought loved him just as deeply. It is the cricket in the box: a lie masquerading as a gift that John readily takes into his narrative because he won't accept the truth of things. Kevin's revelation is as much a reflection of how broken John's family actually is, as Michael's story in church. But they can come back. No matter how far gone any one person seems to be – guilty of murder, shot through the heart, trapped in her own body, stuck in the den in iniquity outside the gates of Jarden, or wrapped up in a cult he doesn't completely understand – there is a way back, there is a way to start over. Again, as much as such ideas are mirrored amongst its characters (the dog, too), it resonates just as strongly when applied to the season as a whole. The degree to which the idea of starting over works, depending on how the viewer choses to read it, makes the finale powerful beyond the "miracles" that take place. "I know you don't think it can happen here, John, but it did," Kevin says not long before being fatally shot and sent back to the place he just escaped a few hours earlier. And by the time John stumbles across Kevin in the emergency care center, miracles big and small seem to have occurred throughout Jarden, from Mary's awakening to Tom saving Nora and Lily on the bridge, all leading up to John's Doubting Thomas moment in the midst of the town being overrun by those waiting to get in. "I don't understand what's happening," he says. "Me neither," Kevin replies. In that moment, The Leftovers effectively doubles down on the idea it takes place in a world that is increasingly inscrutable and out of everyone's control. This idea is helped by the direction of Mimi Leder, who makes a series of terrific choices to heighten the emotion of what's happening in and around Jarden. Leder's choice to have the confrontation between Erika and Evie unfold without audible dialogue is one such example. The impenetrable nature of the emotions of Evie and her friends and the Guilty Remnant's ability to get such a firm grip on those feelings and exploit them to its own ends – especially under the guidance of the now-terrifying Meg – is expressed in the way Erika's words have no sound and further underlined by her own impaired hearing and eventual use of sign language. The storming of Jarden by the GR and those waiting to get in, and the Sodom and Gomorrah-like bacchanal that unfolds in its aftermath, speaks to the impossibility of absolute control and the terrifying uncertainty that has defined the world for Kevin, Nora, John, Erika, and everyone else. But in the final moments of the season, despite the hellscape of Jarden, The Leftovers hints that one thing is for certain: no one has to be completely alone. "What if there's nobody home?" John asks Kevin. "Then you come over to my house," Kevin replies before walking inside to find his family waiting for him. Like putting on the Mapleton police uniform in the hotel of the afterlife, Kevin knows exactly who he is now. He knows exactly where he's supposed to be. And after an absolutely beautiful second season, The Leftovers does, too. Evie and her friends must have been driving around for a while to give Kevin a chance to fall asleep and make his way to the lake he tried to drown himself in. Where were the two other girls' families? It makes sense that the series would focus on Erika and Evie, but it seemed odd that there was no one specifically being pointed out as the other girls' family. It's fun to imagine the earthquake and Mary regaining consciousness might be a response to Nora's rage. Matt Jamison shaves like a maniac. Thanks to everyone who stuck around, read these reviews, and participated in the comments. Hopefully, we can do it again next year. 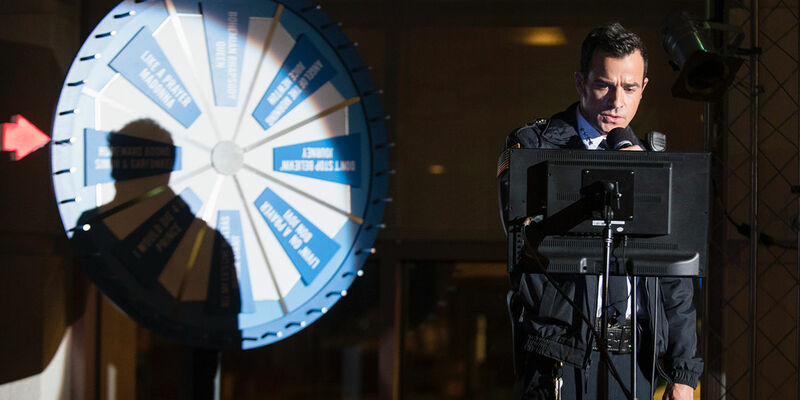 Screen Rant will keep you updated with the future of The Leftovers as news is made available.